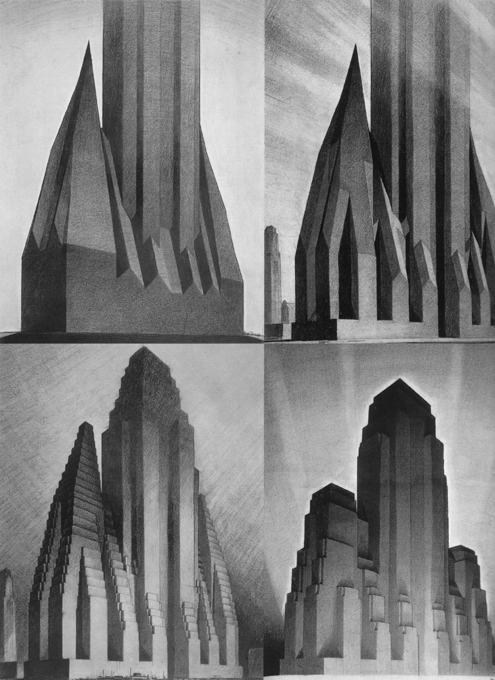 There was nothing new about proposals for a vertical, industrial metropolis. By the 1920s, various visions had been floating around for over a generation. Possibly the earliest was King Champ Gillette’s “Metropolis,” which he outlined in his book The Human Drift (1894). Gillette proposed a city of high rise towers to be located in the region of Buffalo, NY and powered by Niagara Falls. 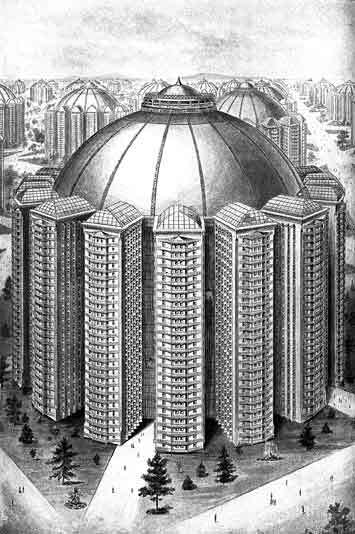 Everyone would live in 25-story apartments arranged around domed atria. Gillette proposed a well-connected street network made of hexagonal blocks and triangular, glass-roofed islands. Below the surface were three levels for electric transport, deliveries, maintenance and infrastructure. Gillette’s blocks were 900 feet across, which was large for a pedestrian-oriented plan but on par with Manhattan’s 800-foot blocks. The Human Drift was in the same tradition as other Gilded Age proposals like Edward Bellamy’s Looking Backward: a socialist utopia aiming to redress the excesses of capitalist exploitation. Desultory efforts to build the “Metropolis” scheme came to nothing. Gillette went on to much greater success as an inventor of safety razors. Visions of the vertical metropolis continued to catch the public’s fancy. 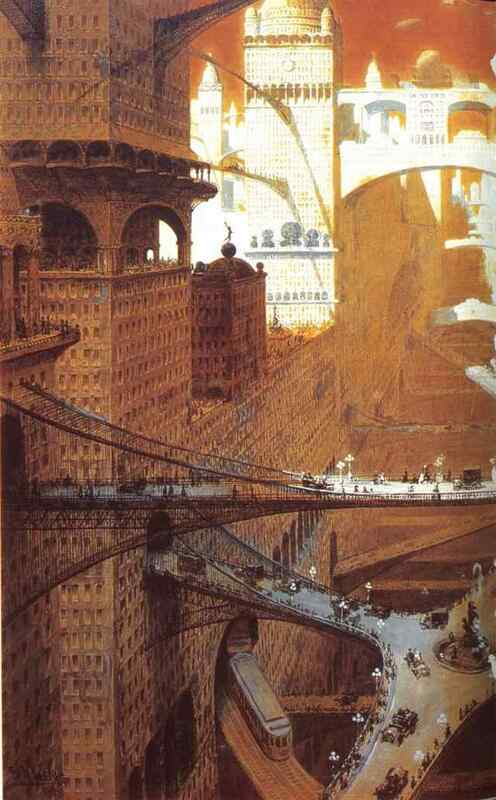 William Robinson Leigh, a painter of wilderness landscapes and Indians, painted his atypical “Visionary City” in 1908. Leigh portrayed the urban superstructure of the future as a vertiginous massif illuminated by a ruddy sunset. But even this megastructural vision had a well-connected thoroughfare network, with bridge crossings spaced at regular city block intervals. 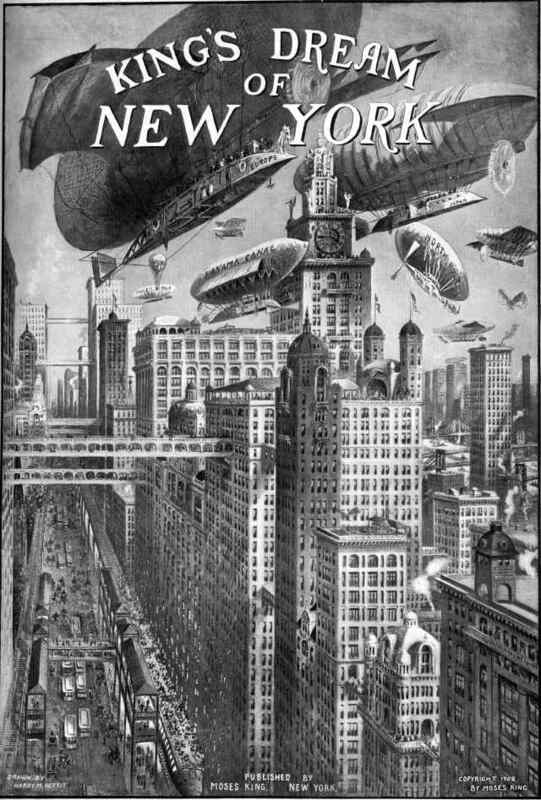 “King’s Dream of New York” appeared in the 1908 annual souvenir book of New York architecture published by the Moses King Corporation. A more bustling version than Leigh’s future, this was the Manhattan of 1908 compounded vertically, yet retaining its fundamental pedestrian orientation at ground level. 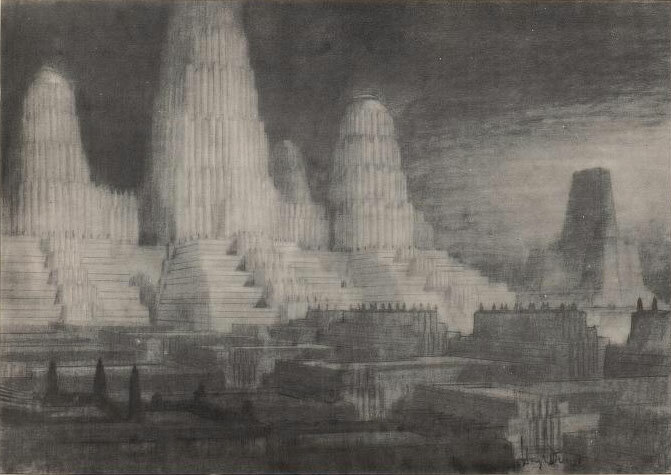 King’s visions of the future metropolis were enormously popular and appeared for several years after his death (in 1909), growing continually more refined. In Chicago, planner Daniel Burnham was commissioned to create a plan for the Chicago region. Burnham was the most famous planner in the nation, having designed and built the epochal 1893 Chicago World’s Fair and having planned the National Mall in Washington. Burnham’s 1909 Chicago plan proposed multilevel thoroughfares snaking through downtown with towers rising above. The upper level was to be a grand boulevard for pedestrians and vehicles, while the lower level would serve as an intermodal freight distribution network. This was actually built (albeit for automobiles only) as Wacker Drive in 1924-26. The vertical metropolis was in the Zeitgeist of the day — but always with a pedestrian and mass transit orientation. In post-World War I America, the vertical metropolis idea continued to develop in response to a growing culture of centralization and professionalism. This was exemplified by the new profession of city planning and the great expansion of zoning power. In New York, architect Harvey Wiley Corbett and illustrator Hugh Ferriss studied the maximum building envelope allowed by zoning, and the resulting ziggurat form became an icon of architectural gigantism and technological optimism. Corbett and Ferriss popularized their vision through books and exhibitions, including the 1925 Titan City show in Wannamaker’s department store. Some schemes had pedestrian scale connectivity via elevated catwalks, but others showed stupendous megastructures expanded to the point where the human figure was lost altogether. A German film director named Fritz Lang was very taken with this version of hyperurbanism. In 1923, he and his wife began work on the screenplay for an epic science fiction film called Metropolis. While still in the development phase, Lang visited Manhattan and the powerful impact of the city influenced his concept for the film. Metropolis, with its groundbreaking special effects, stood for 50 years as the preeminent cinematic representation of hyperurbanism and influenced countless films and television shows. Although certain urban districts around the world bear a resemblance to the vertical metropolis, today it lives on more in popular imagination than in real life. Two other trends have had a much greater influence on the connectivity of the built environment: modernism and regionalism. Modernist European architects were emphatic that city plans embody the very latest technological innovations in both letter and spirit. In his “Plan voisin pour Paris (City for Three Million Inhabitants)” of 1922-25, Le Corbusier made the most dramatic leap yet towards the auto-oriented city. He demanded that existing cities be razed and built anew from the ground up. 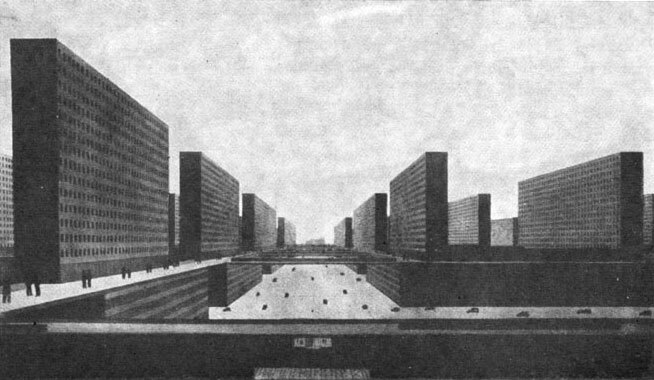 He proposed a thoroughfare network composed of multi-level freeways, forming a grid of superblocks 1,300 feet on a side. All citizens would live in 60-story towers and slabs, creating densities of 400 people/acre while also freeing most of the surface as open space for sports and decorative landscaping. The automobile ought to stop right in front of any given door… which means that the houses open out onto the traffic lane. And that is what we can no longer tolerate: TO LIVE! To breathe — TO LIVE! Homes to inhabit. The present idea of the street must be abolished: DEATH OF THE STREET! DEATH OF THE STREET! Because freeway ramps would connect directly to the towers’ garages, there was scarcely any need for people to walk anywhere. But in case they did have the desire, there would be underground tunnels allowing pedestrians to access neighboring superblocks and streetcar stops. The skyscraper has petrified the cities. In an age of speed, the skyscraper has congested the city. A statement of fact: the skyscraper has reinstated the pedestrian, exclusively. The pedestrian crawls at the feet of those skyscrapers like a beetle at the foot of a steeple. Le Corbusier was a master salesman and became one of the most respected architects of the 20th century. Although no entire city was built according to his plans, today many urban districts around the world resemble his vision. America in particular was receptive to the “tower in the park” idea, and it guided scores of public housing projects, urban renewal projects, office parks and downtown reconstructions. However, the American realizations were far less dense and concentrated than Le Corbusier had specified. The repetition of the blocks resulted in too much uniformity. Every natural thing was excluded: no tree or grassy area broke the monotony… the result was more a necropolis than a metropolis, a sterile landscape of asphalt and cement, inhuman in every aspect. — In the Shadow of Mies: Ludwig Hilberseimer, Architect, Educator, and Urban Planner, p. 17. In the late 1920s, Hilberseimer began to theorize more dispersed settlement patterns with more green space. He proposed a strict separation of uses into dedicated districts: industrial, commerce and administration, and residential. He developed “branching” or dendritic thoroughfare patterns to eliminate automobile conflicts and danger to pedestrians. This, then, is what the default development pattern in the U.S. came to resemble most closely: a collection of isolated, single-use pods, each depending from highway-type arterials. Every local street ended in a cul de sac. The principle of disconnection was comprehensive and absolute. Hilberseimer fled Germany and began teaching at the Illinois Institute of Technology with Mies van der Rohe in 1938. He was the founder and chair of IIT’s Department of City and Regional Planning and helped to rewrite Chicago’s building codes. Many people shared Le Corbusier’s revulsion at the stress, crowding and pollution of the city, but most had a different solution in mind: escape to a more idyllic, more rustic town or village. In the field of urban planning, that urge was expressed in the Garden City movement. The first Garden City was Bedford Park in London (1875), but street patterns were well-connected until English architects Raymond Unwin and Barry Parker began the design of Hampstead Garden Suburb in 1905. Until that time, cul de sacs were viewed as cesspools of poverty and disease. They were actually outlawed by a nationwide street ordinance in order to ensure better living conditions. 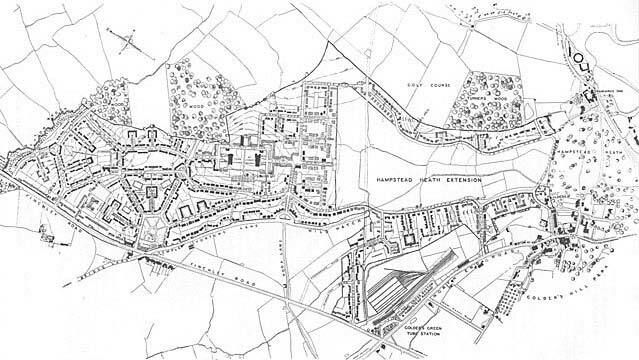 Parker and Unwin wanted to design Hampstead with numerous short (400 foot) cul de sacs, so they lobbied for, and won passage of, “The Hampstead Garden Suburban Act” that legalized their design. Hampstead Garden Suburb featured large blocks that averaged about 1,000 feet across at the longest dimension. Many blocks had a garden or orchard at the center; the entire development was designed so that every household could have a producing garden. The blocks had pedestrian lanes continuing from the ends of the cul de sacs, so that the pedestrian network was well connected even though the vehicular network was not. The garden city leads to individualism. In reality, to an enslaved individualism, a sterile isolation of the individual. It brings in its wake the destruction of social spirit, the downfall of collective forces; it leads to annihilation of the collective will; materially, it opposes the fruitful application of scientific discoveries, it restricts comfort; by increasing the amount of time lost, it constitutes an attack upon freedom. Many others felt differently. 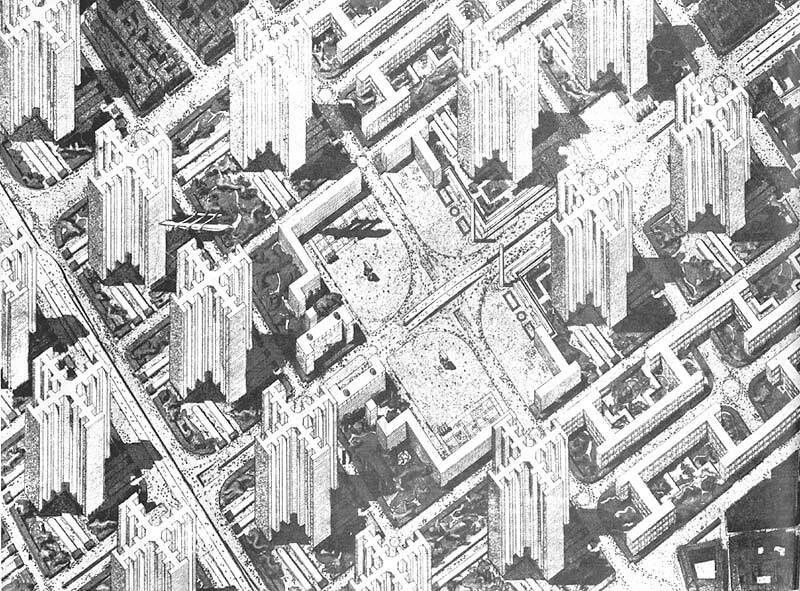 A group of American architects and planners felt the Garden City approach, including its regional planning aspects, was an ideal solution to urban overcrowding, housing shortages, pollution, crime and sickness. Two members of that group, Clarence Stein and Henry Wright, took a study tour of Letchworth and Hampstead Garden Suburb in 1922. They knew immediately this was the model they needed. In 1923, Stein and nineteen others founded the Regional Planning Association of America (RPAA) to adapt the Garden City for American needs, and to develop an alternative vision of regional planning. They invited Raymond Unwin to help develop their theoretical framework. 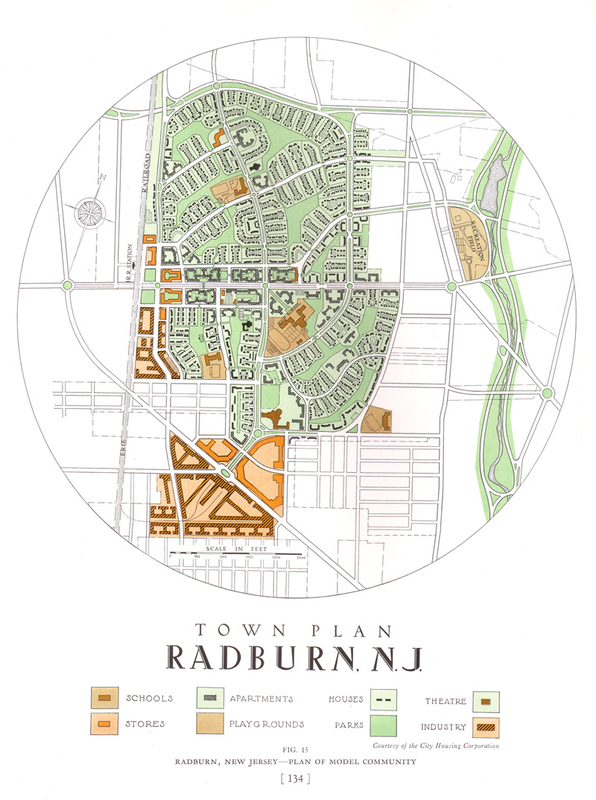 For Unwin this began several rounds of consulting and lecturing in the U.S.
Stein and Wright designed Radburn, N.J. in 1928, the first U.S. development planned exclusively with superblocks and cul de sacs. Residential blocks averaged about 2,500 feet in length, and each had parkland in its center. Pedestrian pathways were carefully segregated from streets, and pedestrian underpasses allowed pedestrians to access commercial areas without crossing major roads. Eleanor Roosevelt helped to form the corporation that built Radburn, and served on its board. This connection proved very convenient for Stein and the RPAA in the years to come. Stein designed or consulted on numerous developments that combined superblocks, cul de sacs, internal parks and pedestrian segregation from streets, most built with federal support and funding. The most well known are Greenbelt, MD (1935) and Baldwin Hills Village, CA (1941). Some of the better known offshoots are Reston, VA (1963) and Village Homes, CA (1975). Far more influential, however, was the federal government’s adoption of language and standards derived from Stein and the RPAA. The Federal Housing Administration’s 1936 bulletin Planning Neighborhoods for Small Houses explicitly rejected thoroughfare connectivity on the grounds that it was wasteful, expensive and hazardous. The FHA recommended dendritic thoroughfare patterns: cul de sacs or loops that led to collectors and arterials. 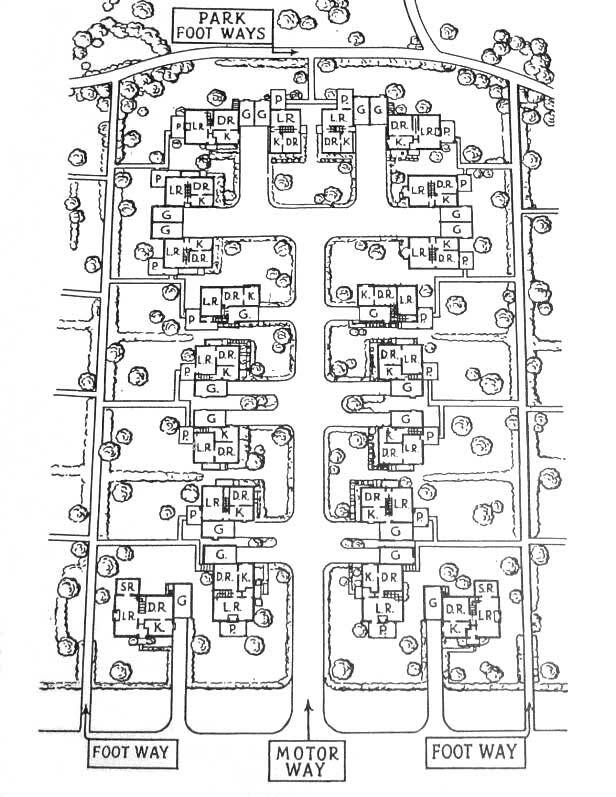 The FHA prescribed cul de sacs as the most attractive street layout for family dwellings. FHA consultants would then analyze plans and suggest layouts conforming to FHA guidelines for securing an insured mortgage. It was a powerful control tool and naturally, almost all subdivision developers submitted plans for review to ensure a guaranteed mortgage. The RPAA had astonishing success getting their principles institutionalized (although some of the consequences were certainly unintended). Margaret Mead once said, “Never doubt that a small group of thoughtful, committed citizens can change the world” — especially when they have the ear of the president. Thus, disconnected street networks became encoded into the very foundation of U.S. land development for the remainder of the twentieth century. Axelrod, Jeremiah Borenstein “Los Angeles is not the city it could have been: Cultural Representation, Traffic, and Urban Modernity in Jazz Age America,” Literary and Visual Representations of Three American Cities, 1870s to 1930s. University of Birmingham Press (electronic book), December 2000. Gillette, King Champ, “Metropolis,” The Human Drift. New Era Publishing Co., 1894. Reprint: Delmar, N.Y.: Scholars’ Facsimiles & Reprints, Inc., 1976, pp. 88-112. Online excerpt edited by John W. Reps.
Hilberseimer, Ludwig Karl, Ludwig Karl Hilberseimer Papers, c.1885-1995, Ryerson and Burnham Archives, Ryerson and Burnham Libraries, The Art Institute of Chicago. Kaderbek, Stan L, “Wacker Drive viaduct reconstruction project,” ITE Journal. March 2001. Larsen, Kristin, “Cities to Come: Clarence Stein’s Postwar Regionalism,” Journal of Planning History. Vol. 4 No. 1, February 2005, pp. 33-51. Le Corbusier, The Radiant City. The Orion Press, 1964. Maliszewski, Paul, “Looking Forward.” Cabinet, Issue 19, Fall 2005. Scott, Mel, American City Planning. University of California Press, 1971. Southworth, Michael and Eran Ben-Joseph, Streets and the Shaping of Towns and Cities. Island Press, 2003. Unwin, Raymond, Town Planning in Practice. Princeton Architectural Press, 1994. Willis, Carol, “Titan City,” American Heritage of Invention and Technology Magazine. Volume 2 Issue 2, Fall 1986. Zimmerman, Claire, “Comrades and Citizens: Hannes Meyer, Ludwig Hilberseimer, and K. Michael Hays” Part. City University of New York, Issue 3, Spring 1998. Excellent rigorous writing, thanks, including for the images. Thanks, Chip. I hope to discuss Ecologically Sustainable Design’s Movement Economy in a later installment. I don’t know anything about Australia’s history of street connectivity policies. How did Australian policies develop in the early/mid twentieth century? Were they developed natively, or were they imported from the U.S. and adapted, or did they come from some other source or process?